I’ve finished my latest round of testing Interactive Governor profiles. The image below shows their respective Z-Scores (number of standard deviations). You can see the previous chart I published on Google Plus. The number in parinthesis is the N value, or the number of samples taken into consideration. The goal of this testing was to see which profiles would offer the best compromise of performance and battery life (specifically Screen On Time). If you’ve followed along with this post series then you know that the benchmark scores are based on the average of 4 diffrernt benchmarks (from 3 different apps). A comprehensive log of all the data I’ve collected can be seen here on Google Drive. If you simply want to know which profile offered the best performance (based on synthetic benchmarks), look at the green bars (higher is better). If you just want to know about screen on time, that’s the purple bars (higher is better). 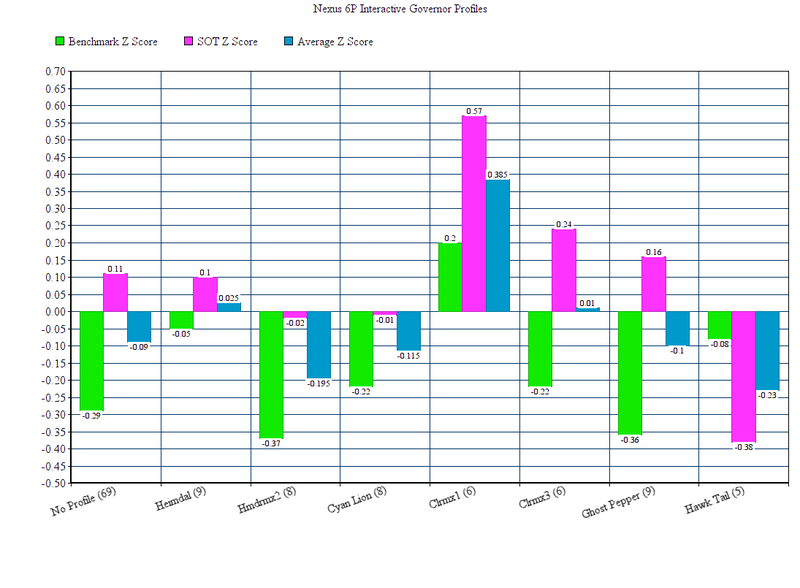 Lastly, the blue bars are are the average of the SOT Z-Score and Benchmark Z-Score (i.e. overall compromoise of performance and battery life). Scripts for all the profiles referneced can be found on my respective GitHub page.